Unanimously endorsed by the editorial staff of Fly Life Magazine.com. Our national legacy of a million square miles of publicly owned lands is what makes America unique, but under President Donald Trump that legacy is being sacrificed. America’s public lands exist today as a gift to us and to future generations largely owing to the foresight and determination of conservation leaders over the past century. During Theodore Roosevelt’s presidency, from 1901-1909, he took the lead, establishing approximately 230 million acres of national forests and parks, wildlife reserves and 18 national monuments. Succeeding presidents have added to his accomplishment, yet under the Trump administration we are literally losing ground. In just 18 months, in collaboration with congressional Republicans, Trump has launched a coordinated and calculated attack on the fundamental laws and policies that guide the sustainable, multiple-use management of these national assets. The cumulative effect of this could set back public-lands management for decades. When Republicans used the Congressional Review Act to rescind sensible Obama-era planning rules for public-land management. They included actions aimed at curbing the methane emissions that contribute to climate change, as well as efforts to protect waterways impacted by coal mining. The Trump administration even sought to permit the sale of public lands. While this effort was rebuffed, the Republican Congress and the White House continued their assault by advancing measures to authorize oil and gas drilling in the Arctic National Wildlife Refuge, shrink the Grand Staircase-Escalante and the Bears Ears national monuments and reopen their formerly protected lands for development, and authorize construction of a road across the Izembek National Wildlife Refuge in Alaska. Under the present plan, large chunks of public lands will become the property of wealthy foreign, national, and multi-national corporations for “development,” which will principally be the extraction of coal, oil, gas, and uranium and precious metal mining. The administration has reversed decisions to prevent construction of the Pebble Mine in Alaska and to curb mining that threatens the Boundary Waters Canoe Area in Minnesota. What’s more, the Republican members of the Montana and Oregon congressional delegation are advancing legislation to eliminate wilderness study areas in their states. And in Alaska, Republican Sen. Lisa Murkowski is working with the Forest Service to eliminate roadless areas on the Tongass National Forest. Under Trump’s policy of “energy dominance,” Interior Secretary Ryan Zinke has directed the Bureau of Land Management to expand and accelerate oil and gas leasing on public lands in spite of historically low demand. As a result, many leases are being sold at the minimum bid of $2 per acre, or else not being bid on at all. Despite local opposition, oil and gas development has resumed near national parks and monuments. Interior Secretary Zinke has also proposed changing the rules that protect threatened and endangered species, even as a Senate bill and nearly a dozen House bills would significantly undermine the recovery of those imperiled species. What is especially destructive in the West is Zinke’s decision to reconsider what had proven to be a successful strategy to protect sage grouse from inappropriate development. Despite bipartisan support for this cooperative effort, including from nearly all the Western governors, 76 percent of new and proposed oil and gas leases are targeted for high-priority sage grouse habitat. What’s incomprehensible is why these areas should be targeted in the first place, when taken together they amount to only one-fifth of the oil and gas potential on BLM lands. More bad policy emerged when the Bureau of Land Management and the U.S. Fish and Wildlife Service reversed existing mitigation policies. Now, land users who damage the public’s lands in developing mineral or energy resources will no longer be required to repair the damage they cause. 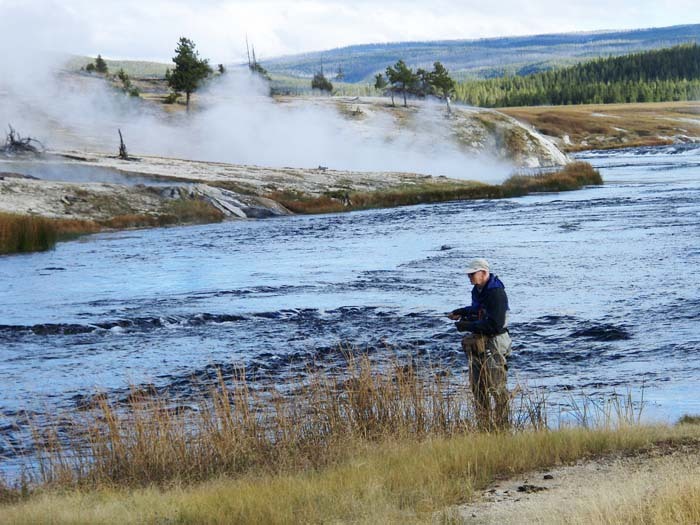 Fly fishing in the Firehole River in Yellowstone National Park. Maybe this will be saved? A wikipedia commons image. One glimmer of hope under Secretary Zinke was his order to protect migratory routes for wildlife like mule deer, elk, and antelope. But with one exception, the Interior Department continues to lease oil and gas in the same wildlife corridors it has committed to protect. I also believe that there is a “right and duty” to use our natural resources to meet current needs. But the destructive policies of the Trump administration — and, more specifically, the Interior Department — are more likely to rob present and future Americans of their right to enjoy their public-lands legacy. 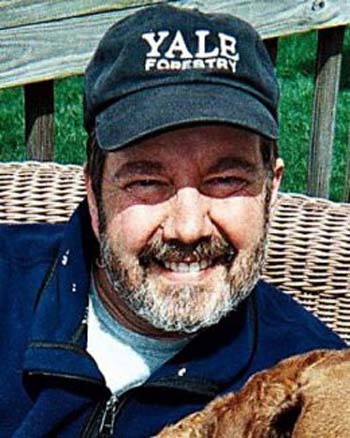 James Lyons is a contributor to Writers on the Range, the opinion service of High Country News. He is a lecturer at the Yale School of Forestry and Environment Studies and senior fellow at the Center for American Progress. Featured Image: Adult Alaskan sockeye salmon encounter a waterfall on their way up-river to spawn. Photo from public domain images – Marvina Munch, U.S. Fish and Wildlife Service.